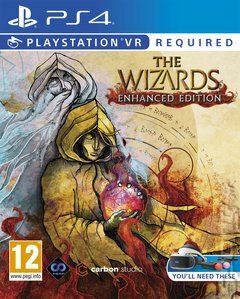 The Wizards is an award-winning action-adventure VR game with an unique system of casting spells with hand gestures and acclaimed narration and voice acting by Jason Marnocha. The Enhanced Edition comes with new content and mechanics as the result of many months of hard work to implement everything our players wished for. It introduces a brand new level and cutscenes, checkpoint system, character customization, improved performance, and many more. Use motion controllers to destroy your enemies by weaving magic into lightning, fireballs, and other elemental spells. Chain combos and use different tactics against the hostile creatures. Make the game as challenging or as casual as you like with Fate Cards, and become the hero you ve always wanted to be with powerful spells at your fingertips!